The initial development of the microscience approach focused on secondary school needs, particularly in chemistry. Providing practical experiences in chemistry is a priority because chemicals are consumables, giving rise to high running costs and significant hazard and environmental impact, if used on the traditional scale. Furthermore there is a need to contribute to life skills development for all future citizens, as regards "chemical literacy". The microscience approach has met this challenge very successfully and stimulated interest in its application at other educational levels and in other sciences. Subsequent developments have led to the creation of kits for primary school science and for more advanced secondary school and first year tertiary level chemistry education (covering electrochemistry, organic chemistry, volumetric analysis). 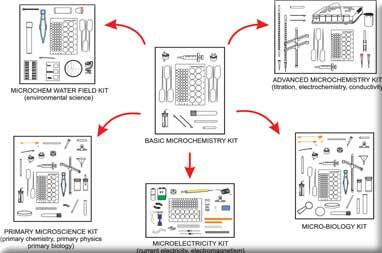 As regards other sciences, the electricity kit developed some years ago has been extended to include electromagnetism and electronics, whilst the biology range of experiments now includes some botany and zoology, as well as some elementary biochemistry. Environmental science has been addressed initially through water quality testing and treatment. During 2011, RADMASTE designed small-scale kits for the Global Water Experiment of the International Year of Chemistry (IYC2011). The kits were endorsed by both UNESCO and IUPAC and were distributed within South Africa as well as to many UNESCO member states, to allow learners of all ages around the World to participate in the Global Experiment. The scope of the microscience approach continues to grow, and this Centre contributes actively to this process.